Its time to dump my ancient stick welder and get a new machine, and the Black Friday deals are luring me in. I've been eyeballing the Miller Multimatic 215 which does MIG, TIG, and stick. Its a hobbyist machine since it only does DC TIG and uses a lift start. With a spool gun you can MIG aluminum. Current deals will get you both torches, a spool gun and a descent helmet for around $1900 from Bakers Gas. HOWEVER, Miller just introduced a new Multimatic called the 220. It is a definite step up from the 215. The 220 does AC and DC TIG so you can TIG aluminum and it has high frequency TIG start. It has a nifty little feature where you can take it off automatic and set it to pulse at .7 to 1 second so you can learn the rhythm to add the rod. This machine is available with both torches and a descent helmet for a little under $3k. Neither one could be considered cheap. I'm concerned that I may have a tough time learning TIG, as it does take a lot of practice and a bit of coordination to use both hands and a foot pedal. I guess if you disregard brand and price there isn't much to talk about- just go with the 220. The brand is good and the price is high, but is it worth it? What would you TIG welders do? A few years back I was looking into a multi process welder, until I checked with my welding instructor buddy and his Miller employee buddy. I was told to avoid the multi use welders as they are a compromise and don't do any one type of welding very well. Thanks RPM, I've gotten that exact response on another forum and now you just confirmed it for me. Given that my current thinking is a Miller 211 MIG and a Alpha TIG 200x. The Alpha seems to be the most bang for the buck but it needs a different foot pedal and torch to make it shine. The Miller gets excellent reviews while the Alpha is rated good, and the package still comes in $500 less than the Multimatic after pedals torches and helmets are considered. I have the miller syncrowave 180 sd tig ,it i a light duty tig but i did build a aluminumbed for a 66 ford pre runner pick up with it . Haven't you ever welded with oxy-acetylene torches? Same or similar technique. I've only TIG welded a couple of times and it was easier than welding with oxy-acetylene torches. Here's a bit of a tip. Those stack-of-dimes weld beads that so many fabricators strive for are not the strongest type of bead. The valleys in those beads cause stress risers just like the sharp inside corner of a bracket or something else. AWS has dimension limits on peaks and valleys in a weld bead. Inspectors will make the welder grind off and reweld beads that look like a stack-of -dimes. That's too bad but it makes sense. I have MIG, TIG, stick, oxy, spot welder etc. You can do almost everything you need with just MIG (using Al gun for Al) if you are only going to use the welder around the home and on your car projects. My question is, do you really need a TIG? I probably don't need TIG. I have some panel gaping to do and a repair on one door that needs cutting out and replaced. Then I was thinking of inner rockers and subframe connectors. There are some things I want to make for the house, but TIG probably isn't a necessity...I just want it. In that case, how about getting a good MiG like Miller and a seperate cheaper TIG stick combination. I use my Miller MIG most of the time; have an Everlast AC/DC TIG and stick and it does the job when I need a TIG. I have the Lincoln Weld Pak 155 that I purchased right after I acquired my 69 Coupe project back in 2001. Shortly after purchasing the welder I converted it to gas. I have been able to do all the welding needed on my 69 Coupe with this machine. 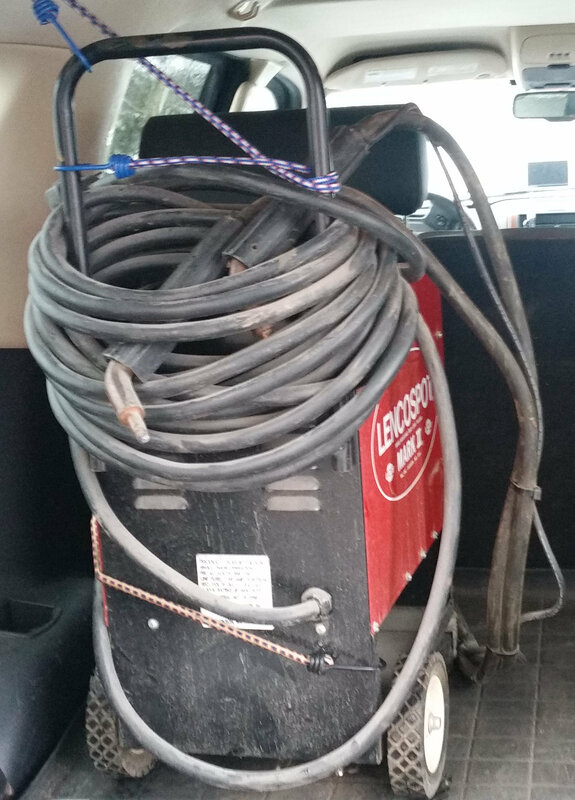 I did have to run a 220V line for the welder but my compressor uses the same voltage so it was ok.
Just picked up a Lencospot Mark II Autobody Dual-Spot Welder Model L4000 for $400. Anybody have or used one before? I am not an experienced welder. Any advice and pointers on how to use it would be appreciated. I used a mig on several projects and was pretty good at it (I thought so anyways....). I switched to a tig on my current project (going on now for 4 years now and a lot of welding). I personally find it hard to go back to mig. personally tig is so much more flexible in terms of what you can weld. stainless, stainless to steel, aluminum, silicon bronze, etc and not even have to change gas mix. it's cleaner (no spatter, smoke all over the welding lens), you control how much filler metal to add, you can fuse metal without even adding metal, you can move metal around, etc. the ability to tack pieces together without adding metal, also makes the final weld joints look better. the different torches and parts allows access to a lot more very hard to get to weld joints that the mig gun can't get to. additionally, since it's much more precise, cleaning/dressing welds after goes a whole lot faster. I probably use the tig over 95% of the time. a water cooler is very nice. the small torch is so much easier to use compared to the larger torches. with the gas cooled, I found it very difficult to wait for the torch extra time to cool. but that's just me. clearly a lot of people own both processes and likely use a mig a lot more than the tig.